The opening continues as a slow burn when we shift to CEL agents Charles Regis and his partner Max Lao. They’re on the hunt for a serial killer, the Mindjacker, that specializes in hacking into people. The story moves back and forth between Regis’ investigation and Latha’s abrupt involvement. 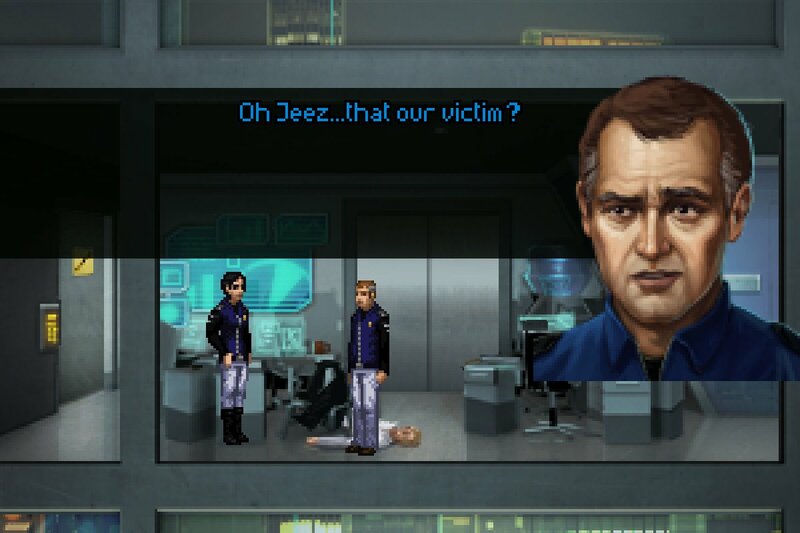 Later, Max Lao opens up as a third playable protagonist with her own important agenda. The plot grows ever more intriguing as we learn more about Regis’ tragic past and the mysterious creation of the all-seeing AI that runs the city. 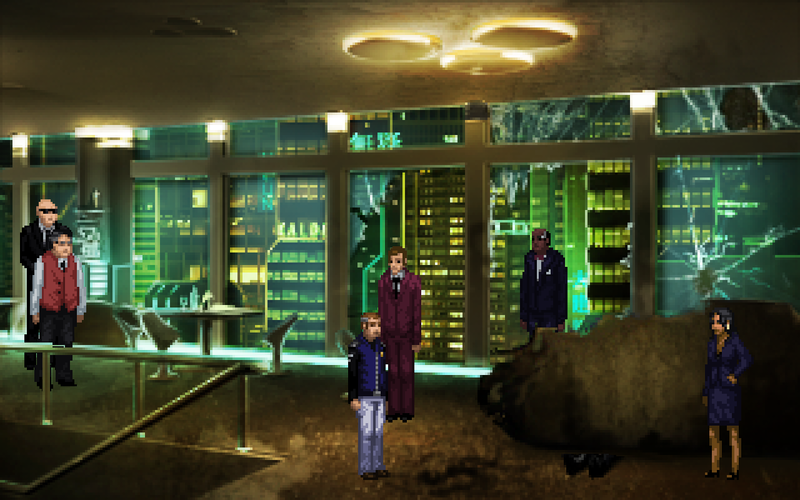 The puzzles in Technobabylon are complex and fun. Often, a single overarching puzzle will require several steps, such as following a trail of clues left in the DNA of plants to create an audio message, or rearranging the programming of an AI maid to extract information regarding a horrific murder. Thanks to the scripted protagonist-switching throughout the story, there’s no backtracking whatsoever. When Latha is held at the Central office, she must escape using the half dozen items and objects around her, as well as utilizing her Trance ability to access both electronic devices and other Trance-users. Since each puzzle is localized within the same few areas, it can be a blessing when trying to focus on what you need to do. This does, however, mean you’re usually only working on one major puzzle at a time, so if you get stuck, there’s no where else to go or other puzzles to try. Despite this, I found the difficulty to be just about perfect. Often I would find myself stuck in an area for an embarrassing amount of time, and just when I felt like throwing up my hands, the answer would present itself through either an item I missed or a solution I hadn’t tried. 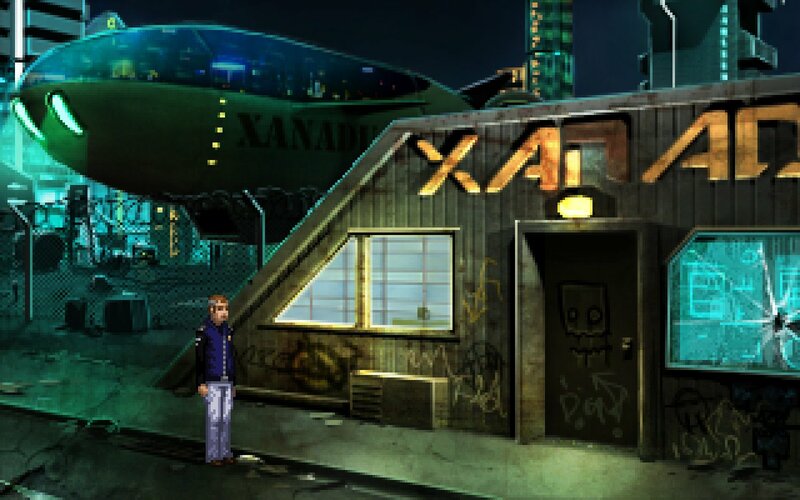 The plot involves a lot of varied locations, including a seedy Trance den, a high rise office building, and an abandoned factory, lovingly drawn in that classic retro pixel art style. I liked the little touch of the talking heads’ different facial expressions during dialogue, and when combined with the strong voice acting, they really sold me on the memorable characters I encountered. We never do get a big picture look at this future world full of bio-engineering and AI outside of our protagonists and their struggles, but this plays to the strengths of the story and the immediacy of the plot. Near the end, we’re finally rewarded with the large, multi-protagonist puzzle that I was expecting. Unfortunately, the final area is a bit of a let-down when compared to the previous puzzles, and consequently, it felt a bit rushed and simplistic. Regardless, the story does reach a satisfying crescendo at the end, and I especially enjoyed that the few important choices I made are nicely reflected in the ending (as well as earning various achievements if you’re playing on Steam). 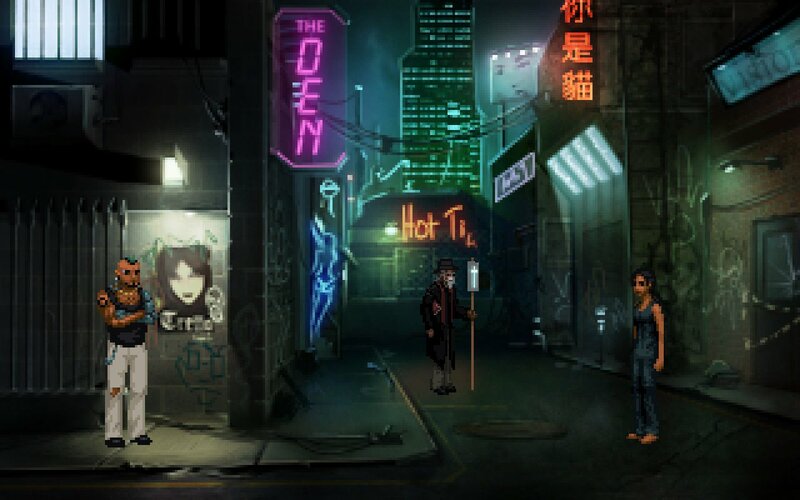 Technobabylon may not make you a new convert to the retro-style adventure, but as a fan, it’s by far one of the best I’ve played. The character interaction and dialogue feel incredibly immersive, and the story, once it picked up, kept me captivated throughout. The puzzles hit that perfect blend of complexity and intuitiveness that keep them immensely satisfying. 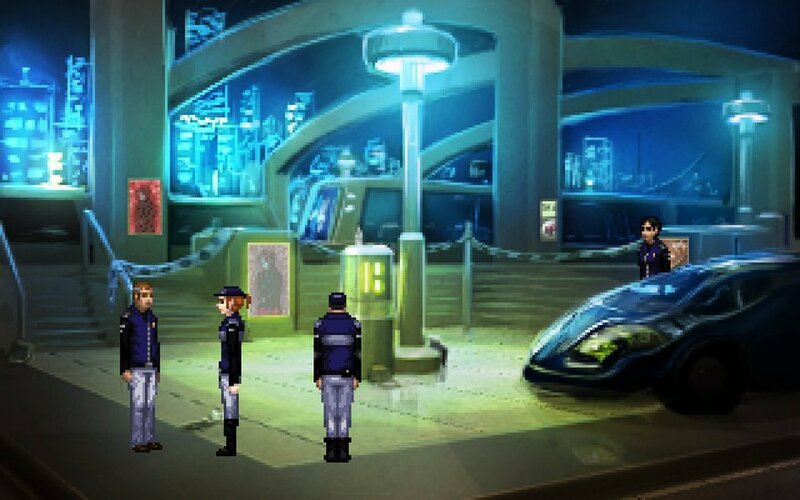 If you enjoy pixel art adventure, emotional story, and puzzles that really make you think, Technobabylon is a wonderful experience. 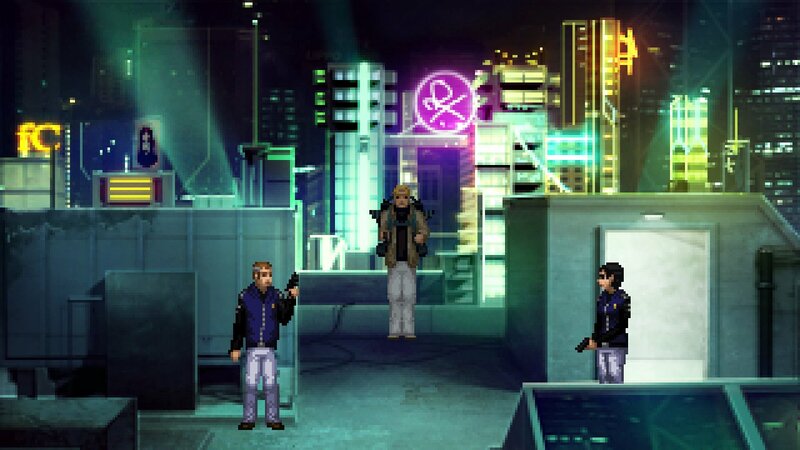 Technobabylon may not make you a new convert to the retro-style adventure, but as a fan, it's by far one of the best I've played.